Jocelyn Bell Burnell is a British astrophysicist. She is best known for her discovery of the first radio pulsars along with Antony Hewish who was her thesis supervisor. She is also the first woman to become President of the Royal Society of Edinburgh in 2014. She was born on July 15, 1943 in Belfast, Northern Ireland. She attended the Glasgow University and obtained a degree in physics. She completed her Ph.D. from the University of Cambridge in 1969. Jocelyn faced some difficulties during her grad school and she once failed an exam that could get her into secondary school. During her Ph.D. Jocelyn helped build a large radio telescope. The land covered by the telescope was big enough to fit 57 tennis courts. She constructed and operated this 81.5 megahertz radio telescope under the supervision of Antony Hewish. After completing her Ph.D. she spent eight years as a professor at the University College London focusing on x-ray astronomy. 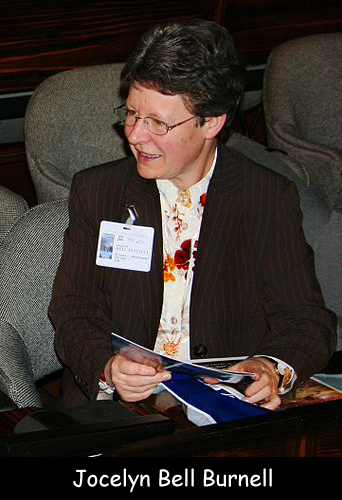 Jocelyn Bell Burnell also served as dean of science at the University of Bath from 2001 to 2004. In 1968, she married Martin Burnell who was a government worker. They got divorced in 1993. In 1974, only Hewish and Ryle received the Nobel Prize for Physics for discovery of the first radio pulsars but Jocelyn did not get any credit. In 2018, she was awarded the Special Breakthrough Prize in Fundamental Physics. She received £2.3 million. She has been awarded 8 medals and over 15 honorary degrees from various universities. Declan, Tobin. " All Facts for Kids about Jocelyn Bell Burnell ." Easy Science for Kids, Apr 2019. Web. 26 Apr 2019. < https://easyscienceforkids.com/jocelyn-bell-burnell/ >.